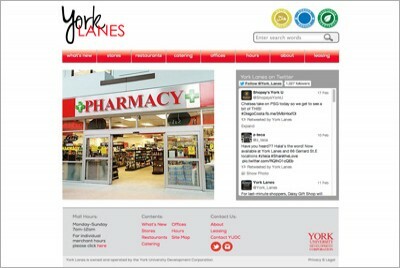 Shopping Mall Web Site :: INHOUSE Productions Ltd.
Development of custom CMS web site with listings of 40+ tenant locations throughout the York Lanes mall at York University, Toronto, ON. INHOUSE was tasked to design and develop a web site that would permit each of the merchants to access their own store listings and manage their content with minimal support. By developing a custom CMS for this project, all of the necessary content such as feature image, description, service type and food category options as well as operating hours are all accessible via one single access point. In addition to the desktop version of the site, INHOUSE developed a mobile version of the site in recognition of the fact that a majority of the audience would be students accessing the site via smartphones. Within a month of launch this was confirmed by statistics which put mobile access at 86%. Initial development completed August 2011. Design refresh completed February 2015.